A mobile home wall is usually 3/8 inch sheetrock drywall covered with a wallpaper design. This vinyl covered drywall can be hard to match if you are looking to repair or replace a piece making mobile home wall repair difficult. The vinyl covering also act as a vapor barrier in new home. 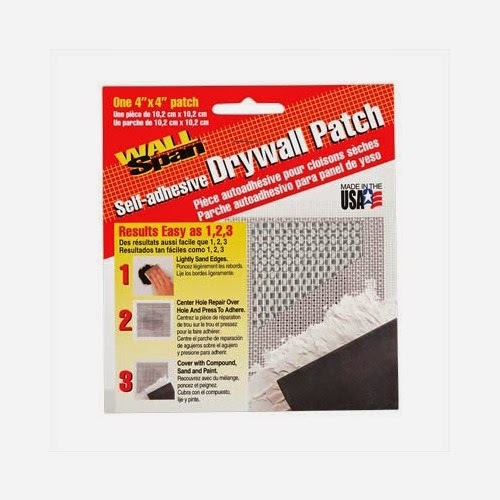 Repair the hole by patching and then paint the wall or entire room, you can use a wall patch to fix this. I like to remove the batten strips that cover the sheetrock seams, then tape and mud them to give it the look of site built homes. You can remove the batten strips then tape and mud, with drywall compound, the seams as you would any sheetrock drywall. This is extra work, but looks good when you are done. I did mine that way. This really makes the rooms look great. This does not cost a lot and is an easy to do repair. If you paint just one wall with a slightly off setting color this will give an illusion of a larger room if you use a lighter color. If you are replacing or repairing sheetrock drywall in the home be sure to use the mold resistant type in areas that are prone to moisture such as the bathroom. The mold resistant sheerock is light green in color to distinguish it from regular drywall board and is now mandatory in some locations. You basically have two choices, either panel over all the existing paneling or replace the damaged piece of paneling. You can easily do it yourself. Remove the batten strips and top and bottom molding. If there is enough of the old paneling left on the wall you can put the new paneling over it if not you will have to take down all the damaged paneling to keep the wall flat and not have any dips, then simply nail up new paneling and then re-install the top and bottom molding and batten strips. The batten strips do not have to be re-installed if you wish. DIY stores carry paneling starting at about $9.00 a 4'x8' paneling sheet. Matching the homes other paneling exactly would be the biggest problem, however you can always paint the whole room to get everything to match. You will need a saw to cut to fit the paneling and a hammer and paneling nails. If can not do it yourself then get some estimates from a local handyman or carpenter. Do you homework on the the material and labor cost. A Door Knob Hole in Sheetrock Drywall and Paneling is very easy to repair without patching and you can eliminate any future damage by installing a self adhesive wall protector door stop. They stick easily and are paintable. These are also great for places that a standard door stop won't work. Drywall cracks can be repaired in one of two ways. If the crack is small you may just be able to use spackling putty to fill in the crack. If the crack is large or if it may have a tendency to run or widen then I suggest taping it with drywall tape then apply drywall compound, sand and paint to match the homes interior. You would primer the walls as you would any wall. You may wish to use a primer like KILZ or ZINSSER for a better looking job, this works great on ceiling stains also that can occur in homes with roof problems. These primers come in white and they will do a good job of covering any prints or stains in homes before painting. Then paint any color you want. Personally I use only latex paints. Less fumes and cleans up easier. Semi gloss paint will stand up to any water splash that may occur around the kitchen, bath or laundry area.